The pursuit of physics is to understand and explain how nature works, from the unimaginably small world of atomic particles to the fantastically vast realm of galaxy clusters. Physicists observe nature and try to categorize and understand the phenomena they observe. Physics is a basic science that is the foundation of many other scientific disciplines and therefore has an important impact on almost all the problems facing modern society. Many people think that physics is something new—but it started before recorded history when people first discovered recurring relationships in the environment. Through careful observation of these relationships and because of nature’s dependability, they found they could make reliable predictions that would seem to give them some control over their surroundings. Physicists solve problems and make discoveries directly through research and indirectly by teaching and inspiring others to look for explanations for the events happening in the physical universe. The faculty’s mission is to prepare students to work confidently and effectively in physics or a related field, to develop the power to think critically, judge soundly and communicate effectively. With the assistance of physics faculty advisors, each student selects a program of theoretical and experimental courses. Students gain an understanding of the broad range of principles which characterize the discipline of physics. Additionally, students acquire the ability to apply theoretical and experimental techniques to explore a wide variety of ideas. Faculty have a personal interest in the success of students and mentor students as they progress to a degree. Meet the Physics Department faculty and staff. 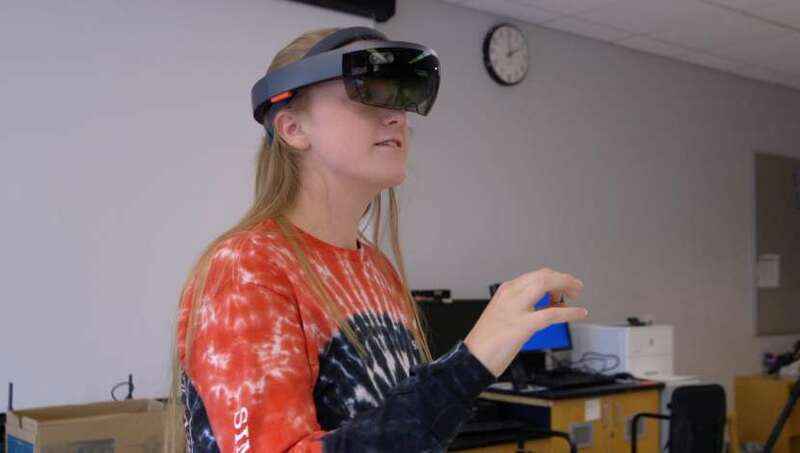 Dr. Steven Binz in Salisbury University’s Richard A. Henson School of Science and Technology is using state-of-the-art equipment to bring interactive 3-D experiences into the classroom. The Physics Department offers a multi-track program of study, giving students the flexibility to pursue a challenging curriculum of inspiring courses best suited to their individual dreams and chosen career. A major in physics prepares students for careers in a variety of high-technology fields, teaching and further graduate studies in physics, engineering, medicine and other fields. Look up. What's up there in the sky? Wondrous jewels – stars and planets. Promising frontiers – planets like Mars and the moon. Exciting speculations – Europa's water and black holes. Make a wish and let’s tour the universe. We want to have our majors complete the physics curriculum with an appreciation of physics as a unified field of study rather than a collection of unrelated courses. The classroom environment is intended to be an intellectually safe yet challenging learning space for both the faculty and student that should facilitate student learning and properly engage the student. The role of the instructor is to help a student become an independent life-long learner and to facilitate a thorough exploration of physics. Diversity among faculty and students is not only respected but encouraged because physics is an interdisciplinary field that relies on a diverse spectrum of individuals and ideas. The Physics Department values global, societal and individual differences and has a commitment to equal opportunity. The knowledge and skills I received from SU physics opened unbounded possibilities, landing me a world traveling position at NASA and preparing me for a master's degree. In addition to the core physics and math courses, the general physics track is designed to provide a student with skills and training needed to work in government and industry or pursue advanced degrees in physics and engineering. Students can choose from a number of areas of study including astrophysics, digital and analog electronics, or engineering. In addition to the core physics and math courses, the physics/microelectronics track is designed to provide a student with skills and training in digital and analog electronics, computer architecture and design, computer programming and interfacing, and robotics. The track is designed to provide students with the skills necessary to enter the workforce directly after obtaining the bachelor's degree. In addition to the core physics and math courses, the engineering physics track is designed to provide a student with skills and training in various areas of mechanical and electrical engineering, including thermodynamics, materials, fluid mechanics, acoustics, digital and analog electronics, and computer architecture. Students take a standard Fundamentals of Engineering (FE) written examination, which tests applicants on breadth of understanding of basic engineering principles. Those who pass the exam are designated “Engineer in Training,” EIT, or “Engineer Intern,” EI. The physics secondary education track is designed to prepare students to teach high school physics. In addition to the core physics and math courses, students take classes in astronomy, biology, geology and earth science, laboratory safety, classroom management, science and reading methods, inclusive instruction, and technology in education. Students are required to do a teaching internship and pass the Praxis II exam for graduation. The dual degree engineering transfer program offers students the opportunity to earn both a degree in physics from Salisbury University and an engineering degree from an ABET (Accreditation Board for Engineering and Technology)-accredited engineering program. Under the program, a student normally attends SU for three years and an engineering school for two years. While at SU, a student must complete a minimum of 90 credit hours including all required General Education courses, the physics core, and appropriate engineering courses. The dual degree engineering student must apply for admission and be accepted to an ABET accredited engineering program. An additional 30 hours, including at least 15 hours in engineering or related courses, must be completed at the receiving institution and be transferred to SU to receive a physics baccalaureate degree from SU. To receive an engineering degree, additional coursework must be completed at the receiving institution according to the requirements of the engineering school attended. For further information on our engineering degree programs please contact our engineering coordinator, Dr. Matthew Bailey (410-543-6486). SU physics prepared me for my career in electronics by providing hands-on instruction in a fun atmosphere. The professors are down to earth people with top-notch expertise in their fields. The department is relatively small, and upper-level major courses rarely have more than 15 students. We support an environment that encourages student involvement, faculty-student interaction and close student-student collaboration with a central idea that physics courses should include hands-on activities integrated with discussions and lecture. In such integrated courses, the traditional notions of lecture, laboratory, computer simulation and other classroom activities are fully blended in practice and conception and are not individual separate entities. The information provided here will help you navigate your career in SU’s Physics Department and beyond. Check out the course-related materials for the semester. The Center for Student Achievement organizes peer tutoring for our physics and engineering students. Taking classes is not the only experience available in physics. We provide undergraduate research opportunities because they are important to the advancement of student understanding, allowing the student to apply the techniques that an active hands-on environment promotes. With close faculty mentoring during the research experience, the students gain skills necessary to organize and communicate scientific results and become successful science professionals. Virtually all physics majors become involved in scientific research related to current topics under active investigation within the scientific community and industry. Students have conducted research on a variety of topics including extragalactic elemental abundances, stellar evolution and supernovae, robotics building and design, alternative energies such as wind and solar, computational surface physics, biomedical physics, quantum mechanics, remote sensing, high-altitude balloon electronics, and a plethora of other scientific topics. Support the Physics Department Today!